Anyway, Scottie Mom asked if I could take over the blog and update our friends since she and Scottie Dad have been out a lot looking for our future home. I said yes, but only if she promised to take Heather and me to a treat store. Good work must be rewarded, no? Plus, Scotties shouldn't work for free. Isn't there some sort of Scottie Labor Law or something? Scottie Mom said we still have lots of yummy treats left over from the goodie bags we got from the parade last weekend but I said Heather and I will have no problem eating more...especially freshly baked ones! Well, in order to get those treats, I've got to hold up my end of the bargain and give my friends some quality entertainment. If I do a good job, let Scottie Mom know that Heather and I deserve a day out on the town of our own. Now, comes the hard part: what to write? I thought of posting a video of me acting silly but realized no one was here to catch it on camera. Then, I thought you might like to hear how I trained Scottie Mom to jump out of bed at the sound of me biting the air (I frightened her too many times with a bark, so I decided to teach her this instead). No, that's not funny enough. Wait - how about a Scottish Terrier wish list to assist those who are Scottie house hunting? That's still not funny - in fact, my list is very realistic - but we'll give it a try. 1. A Backyard Full of Adventures. Sure, flat grass is nice to roll around in but if you really want to go above and beyond (which you should, we are Scotties after all), landscape it like my friends Syd and Oz's Scottie Mom and Dad did with different textures, stone pathways, stairways to new adventure levels and even a water feature. Sure, you might not like it when we dive in to surprise the fishies but there's nothing better than a cool dip on a hot, summer day! 2. Special Scottie Spaces. We like to be everywhere you are so, make a little room for us with a cushioned pillow under the bay window seat in your kitchen or even at your desk in the study. See some great examples on our Pinterest page. And hey, if you want to have a never-ending treat bowl in each of these places, you won't hear us complain. 3. A Walkable Neighborhood. Scottie Moms, I can't stress this one enough: your neighborhoods have to be walkable! My Scottie Mom and I went from walking an hour or two every day, round and round in circles to walking a little strip silly city people call a "dog walk" four times a day so Heather and I can take care of business. With a walkable neighborhood, not only will we be healthier but you get to showcase your Scottie pride to every person you pass. 4. Make the Bonus Room a Bonus! Some houses come with something called a bonus room, so why not make it a true bonus? I'm thinking a room we can eat, sleep and play with soft, plush carpet (I promise not to pee! ), a large bin of toys to choose from, and variety of chairs, couches and cushions to snuggle up on. If there's room to have a window seat, great - I may not like cats but they got the window watching thing down great. Plus, I need to earn my keep somehow. Might as well keep my people safe! 5. An All-Access Pass. Ok, Scottie Dads...listen up! No matter what house you decide on, one issue must be addressed: no more restricting us from certain areas of the house. If you can get your "man cave," then we should get a room of our own, too. And I choose: ALL ROOMS! Haha. Ok, Scottie friends - your turn. What would your Scottie dream house include? Did I leave anything out or did I do a good job covering the basics? Oh I wish you ma and pa lots of luck in finding the perfecto house, only the best one will be acceptable for two adorable scotties I'm sure! Hey, Jack and Maggie here! 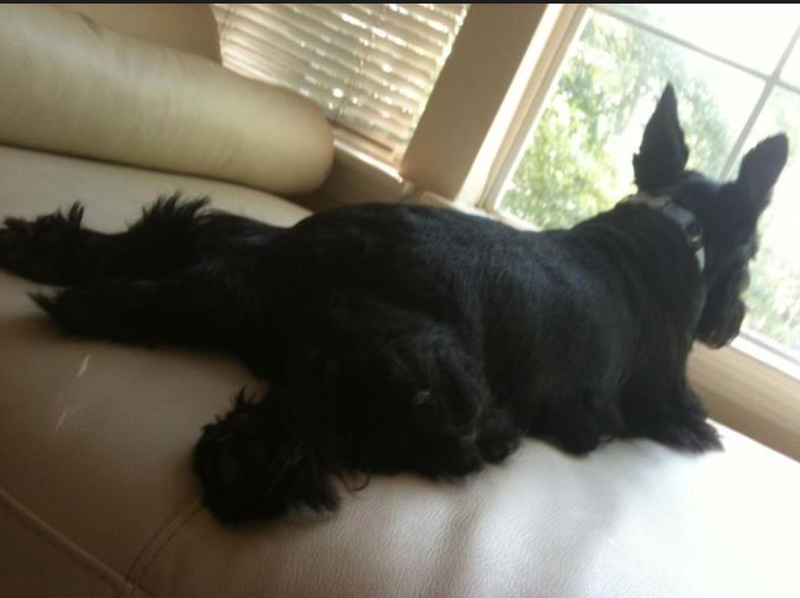 Another important factor to consider in a Scottie house is if there are any dogs next door. No mean fence running big dogs that bark and act as if they are the kings of the block! Any self respecting dog knows that Scottie's are king, and the neighbour dogs should be respectful and mindful of Scottie superiority. We appreciate having woodland creatures in our neighbourhood. chipmunks and squirrels provide much entertainment, and even the local marmots are a welcome addition. we suggest Scottie Mom and Dad look for an area where there will be sure to be interesting intruders to chase. Our Scottie Mom suggests keeping in mind where to bathe Scottie's in a prospective home, although We do not place the same value on that as she does! My-o-my Mr. K! You are right on target! Your wish list couldn't be more complete. But just remember: should a few of your wishes not materialize just remember how much true, true love Scottie Mom has for you and Heather. That alone is worth the world! I would add a fenced garden for my requirements (though I'm not a Scottie). This is to protect me from the mad Rhodesian Ridgeback who lives in the garden next to us. We have a brand new fence and I swear there are times he sounds like he's going to gnaw through! I feel for him, I really do, but I doubt he'd give me chance for psycho-analysis before he took out his angst on me! So fences. Also it stops me wandering out which is a distinct possibility because I can be curious. Bonnie says you should come out here. A couple of acres, lots of trees, squirrels to bark at, lots of people to give pets and treats and plenty of room and a DOGGY DOOR for indoor/outdoor zooming. Hope you find a nice house! Definitely a well secured garden where Scottie Mom and Dad can be confident you won't escape. We have a "dog flap" so that we can get in and out when we feel like it (we do have really secure garden so it's safe for us to venture out when They are not here either). Agreed on the garden with different interesting "rooms" to investigate. A few local walks you can start from your own home, rather than having to drive miles and mile ..... soooooo boring! but not unacceptable of course! Other than that I think your Scottie Mom and Dad have got it covered. Can't wait to see your new home!